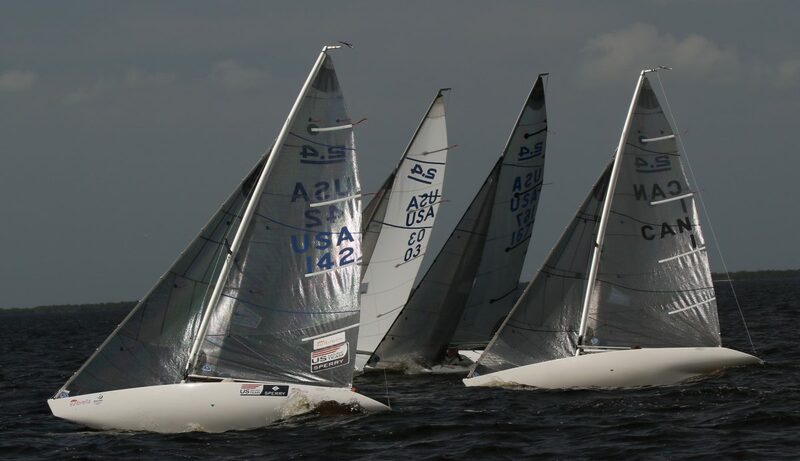 The first regatta of the second annual CanAm Regatta Series finished yesterday with all six races complete in beautiful, warm Charlotte Harbor, Florida. First day was pretty light 3-6 knots of wind that shifted quite a bit. The current running out of the harbor kept everyone on their toes making lay lines hard to master and leaving passing spots for some. It was quite a close first beat to the first race as 3 boats rounded overlapped. Bruce Millar made the most of the run on the right side and was able to get a small edge at the leeward mark and carry it to the finish. I had to hold off Peter Eagar at the finish for second. Bruce set the pace by sailing a very nice race all around. The second race, I got off to a good start and lead around the course. Peter Wood sailed a very good race for second place and Bruce followed with third. These races were very light and shifty with the current running left to right on the race course. The wind died at the finish of the second race and we waited around for over an hour before the PRO sent us in. With only two races sailed the first day the schedule was changed to start early to be able to get in 4 races to complete the series. It was quite light when we sailed out to the course but a nice breeze came in just in time. PRO Roger Strube set up a good course quickly and we were off. My start was another good one and lead around. Bruce was a close second but over stood the second top mark and let Tony Pocklington slide in for second. This gave me another two points over him, which I needed. The second race of the day was pretty similar, I lead, Bruce second and Charlie Rosenfield had his best race for third. The wind went right in this race and was moving toward a sea breeze direction. With two races left it seemed to be a two boat race Bruce and myself. The next race I started on the wrong side of the line. I won the right side, Bruce won the left side, When we crossed he was well ahead and so was Tony. I did get the third but with Bruce winning, there was only a 2 point gap to second where Bruce sat. No other boat could have passed either of us, so it was all on in the last race. I was not going to be too far from Bruce at this last start. In fact he left himself open so I push him off the pin side of the starting line. A few times. When I returned to the line I was surprised to see most of the fleet on the right side of the line and giving me the pin to start on port, crossing. That worked out well. Bruce a few boat lengths back could not cross and tacked toward the left. I tacked with him to make sure I stayed with him. Went off to the port layline and ended up rounding with Allan Leibel. And that was pretty much of the series. Allan sailed his best race to win, Second for me, Third for Tony and Bruce fourth. It was a very good two day series. Now we have one day off and we sail the second CanAm regatta, the 3 day US Nationals, which count double… We have a guest joining us from Norway, Bjornar Erikstad. It is always a pleasure to sail against him. This will make it a 19 boat fleet. With a cold front due to come through, there will be much more wind and not the 83 degrees on the course. But the cool 70 degrees is much better than further north….